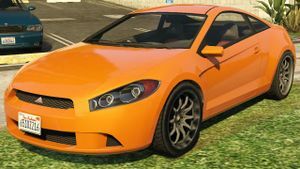 A Penumbra in Grand Theft Auto V.
The Maibatsu Penumbra is a sports car in Grand Theft Auto V.
The Penumbra is primarily based on the 2006—2012 Mitsubishi Eclipse, with headlights from a Dodge Dart. The rear appears similar to that of the Audi TT. The Penumbra is a low-performance vehicle, capable of a top speed of approximately 102 mph (164 km/h). Its acceleration power is also moderate. However, being somewhat small, it has good cornering abilities. As it is front-engined, the Penumbra can be disabled within several huge frontal collisions, while it can withstand damage at the rear. A penumbra is the region of the shadow in which only a portion of the light source is obscured by the occluding body. An observer in the penumbra experiences a partial eclipse. This page was last modified on 29 April 2015, at 22:25.